KCET: How El Camino Real, California's 'Royal Road,' Was Invented - Yo! Venice! KCET’s SoCal Focus has an interesting article by Nathan Masters about El Camino Real up today. Suggested reading for natives and transplants alike! 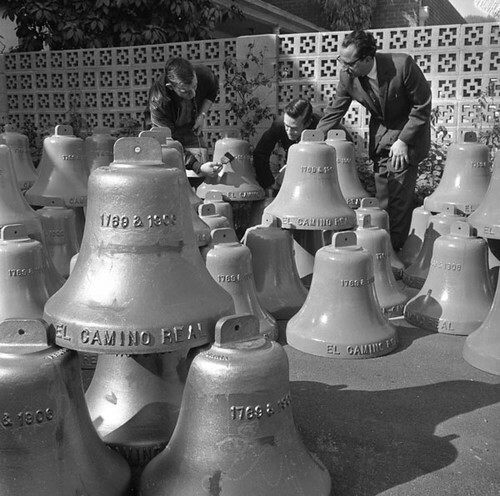 Along Highway 101 between Los Angeles and the Bay Area, cast metal bells spaced one or two miles apart mark what is supposedly a historic route through California: El Camino Real. Variously translated as “the royal road,” or, more freely, “the king’s highway,” El Camino Real was indeed among the state’s first long-distance, paved highways. But the road’s claim to a more ancient distinction is less certain. The message implied by the presence of the mission bells — that motorists’ tires trace the same path as the missionaries’ sandals — is largely a myth imagined by regional boosters and early automotive tourists.